I started climbing back in December. It was a dark and freezing evening, a Monday or something. My boyfriend, Harvey, and I were driving back from a night camping on the Isle of Skye when we decided to stop at Fort William so I could learn to climb, despite being pretty knackered after a day of speed-hiking along the Scottish Moors of Skye. Harvey promised he'd teach me to climb as soon as we met, in this very town. It took a couple of months but we finally made it to a wall. I didn't learn much about ropes and knots or anything on that first evening. 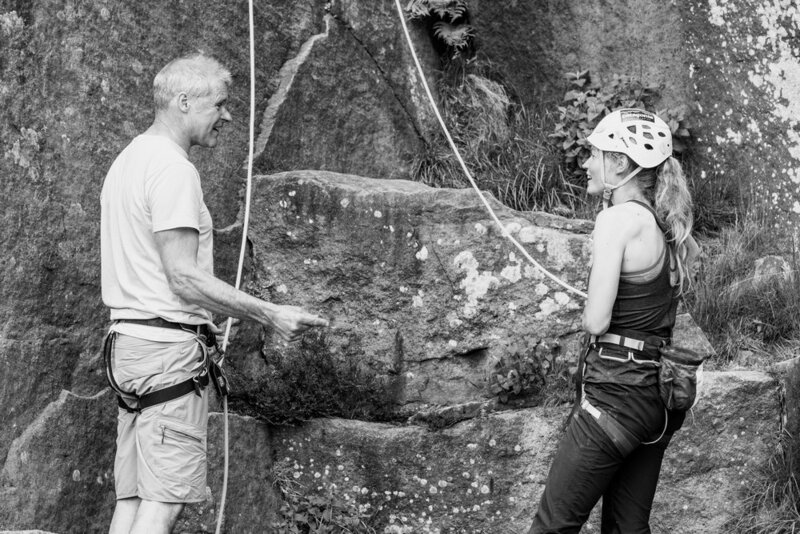 I had to be shown how to put a harness on myself, while Harvey tied the rope into me, and with some slightly clammy hired climbing shoes I stepped up onto the wall, pulling on plastic holds until I reached the top of it. My hands were shaking with every pull, my heart was beating out of my chest, but I'm sure I was smiling the whole way up. I didn't look down until I got to the top, when I was terrified to let go and make my way back down. That fear would define most of my climbing experiences for the next few months. Fear and exhilaration, followed by a constant desire to just go climbing again and again and again. My first outdoor climbing experience wasn't much different. 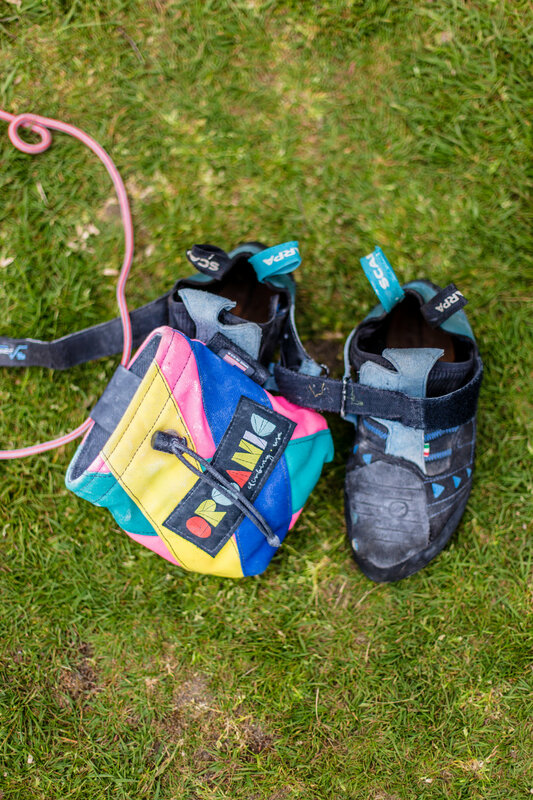 Despite having climbed consistently throughout the winter, even learning some lead climbing and tackling grades much harder than I thought I could, when I did my first outdoor climb on Welsh limestone I was reduced to a quivering mess. With my new harness, belay, carabiner and helmet, I was kitted out with everything I could need, but somewhere along the way I forgot how to climb at all. It took a few routes up the face of the quarry, a lot of patience from Harvey, and some self-motivating mumbling from myself to finally get into the swing of it, and as we ate fish and chips on the way home that evening, I imagined many more summer evenings being outside until dark, climbing up rocks and enjoying hilltop views. Climbing, I realised, might always scare me, but I just wanted to get better, stronger, braver and be outside more. To just go climbing again and again and again. 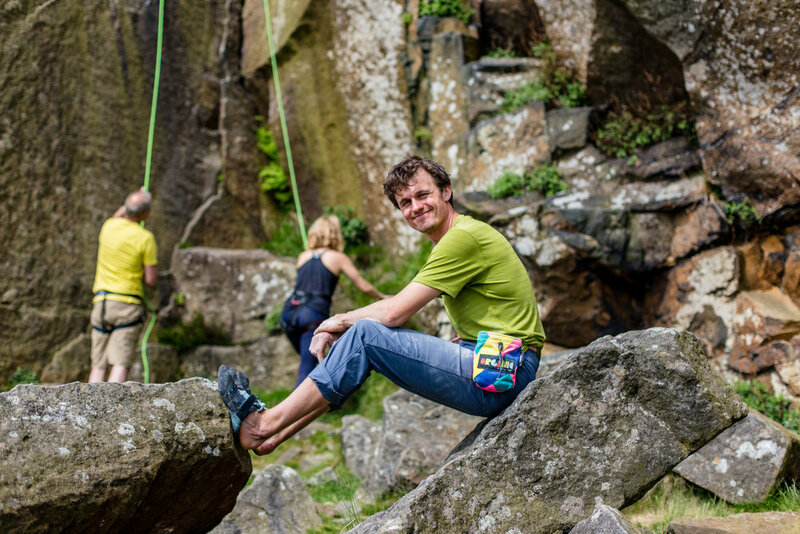 So, when Patagonia invited me for a day of hiking and climbing in the Peak District, I was beyond excited to head out and do my first climb on gritstone - the hard, gritty rock that defines the landscapes of this part of the world. Not only that, but we would be climbing with two legends: Jerry Moffat, a long-standing friend of Patagonia and one of the greatest climbers of all times, known for his fearlessness and ability to push boundaries; and Robbie Phillips, a Patagonia climbing ambassador who travels the world climbing on rock, and has most recently been working on a two-year ongoing project in Cachamo, Chile. 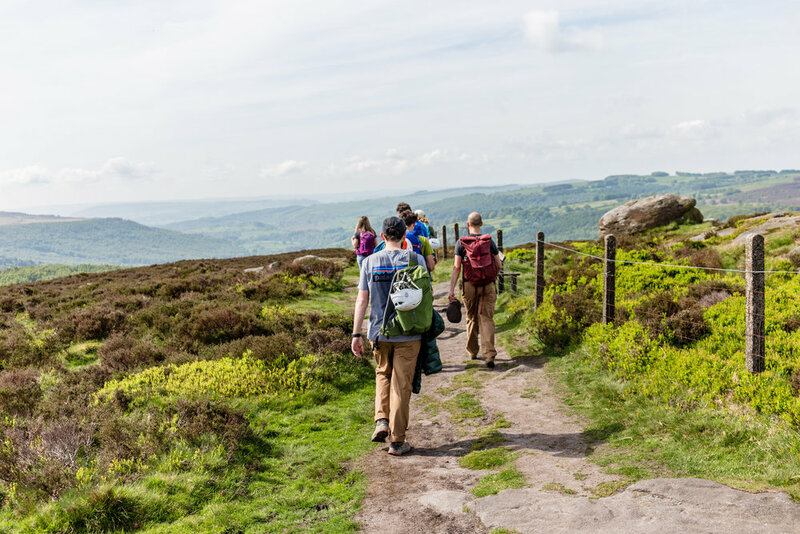 Last Friday, a group of six journalists and three members of the PR team set off rambling from Hathersage in the Peak District to Froggatt Edge, our climbing location for the day. 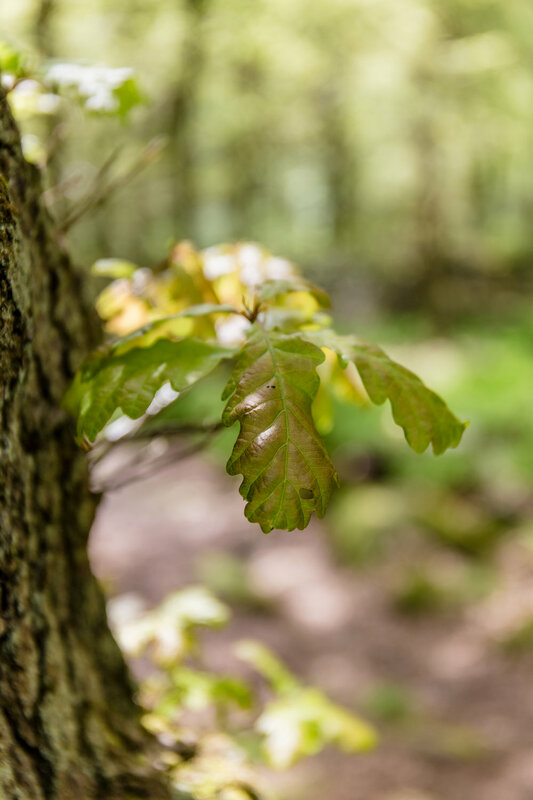 The hike took in bluebell covered woodland, vast valleys of rolling hills and rocky cliffs, the deep edges of Padley Gorge, and a tea stop at no-frills Grindleford Station Cafe. 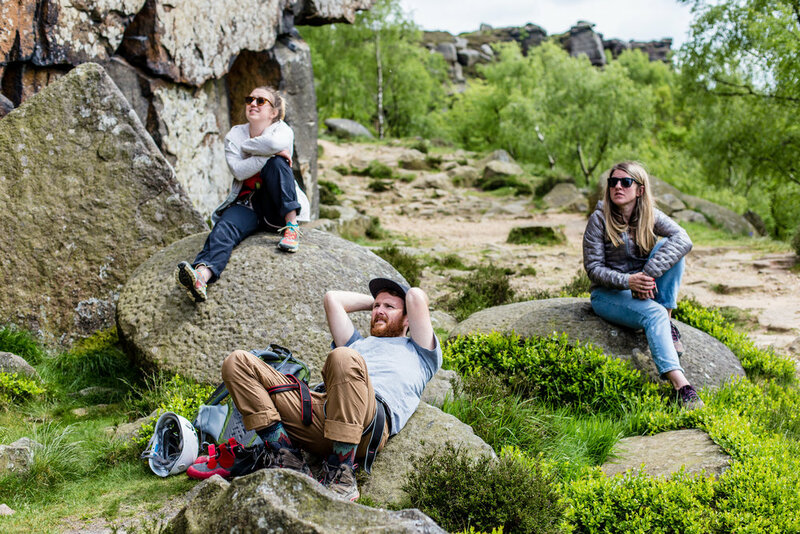 We ended at forest-covered Froggatt Edge, where sandwiches and ropes were ready for a group of very hungry hikers, soon to become climbers. I was keen to get on the rock straight away, barely eating a thing before I set off up (what turned out to be) a very easy climb, almost like a scramble. I immediately wanted to try something harder, choosing a second climb that was tricky at the beginning and ended with another easy scrambly section. A lot of us there were novice climbers, so it was great to have Jerry coaching us up the rock or Robbie shouting advice from the ground about where to put a foot or hand for the next move, or how to move your body on difficult sections of rock - things I never would have thought of at this stage in my climbing. But this was the first time that I felt confident on rock, not afraid to try something hard but eager to see how far I could push my body and overcome more fear. 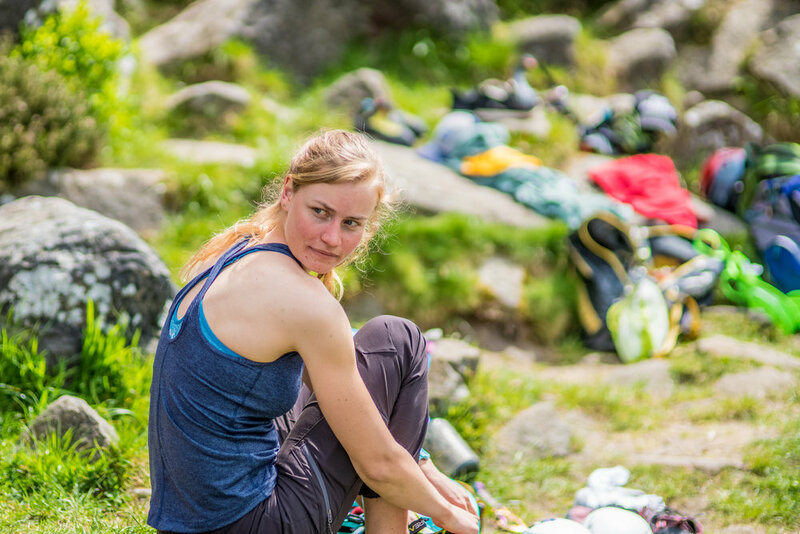 In and amongst the climbing, we grazed on snacks, chatted all things outdoors, and enjoyed the warm weather and Peak District views. old-school gear and guidebooks - I loved this! 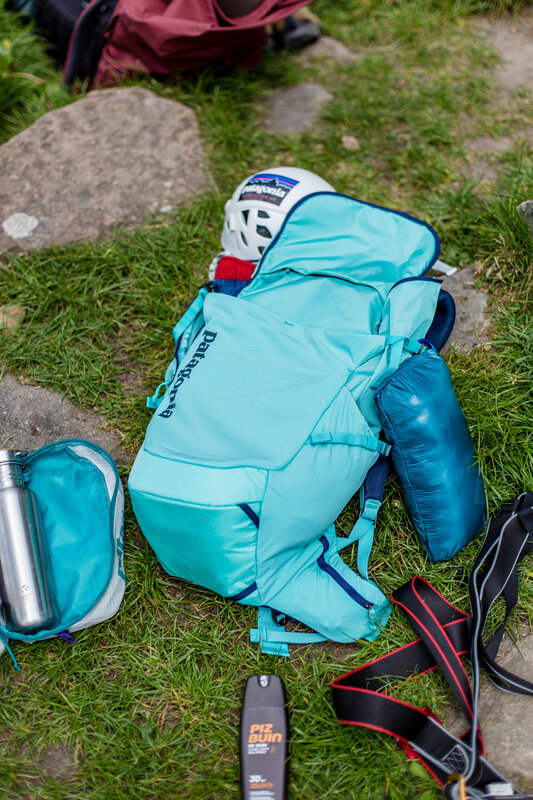 It's probably worth explaining a bit about what climbing means to Patagonia, as a brand. Climbing, in short, is where it all began for Patagonia. Founder, Yvon Chouinard, started making tools for climbers back in the 50s and 60s, selling pitons (small metal spikes that people used to hammer in to the rock so they could ascend) to his friends for $1.50, made in a small shack in Ventura, California. Today, that shack still stands and the business has been expanded into a billion dollar company, no longer selling climbing hardwear but technical alpine clothing with a strong focus on environmental and ethical issues. 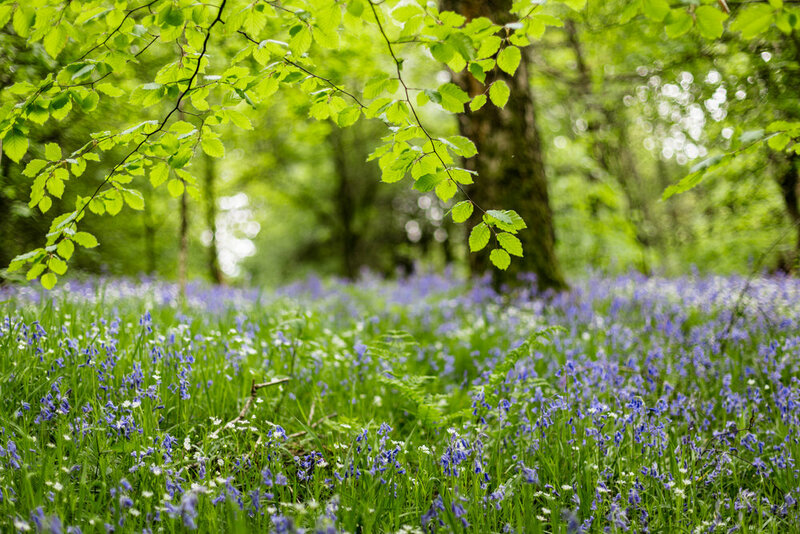 Indeed, it's not all about the money for Patagonia; the brand is committed to making clothing in the cleanest way, causing minimal impact on the earth - even discouraging customers from buying something new until their old gear is completely worn out. Repair, reuse, recycle; "build the best product, cause no unnecessary harm". 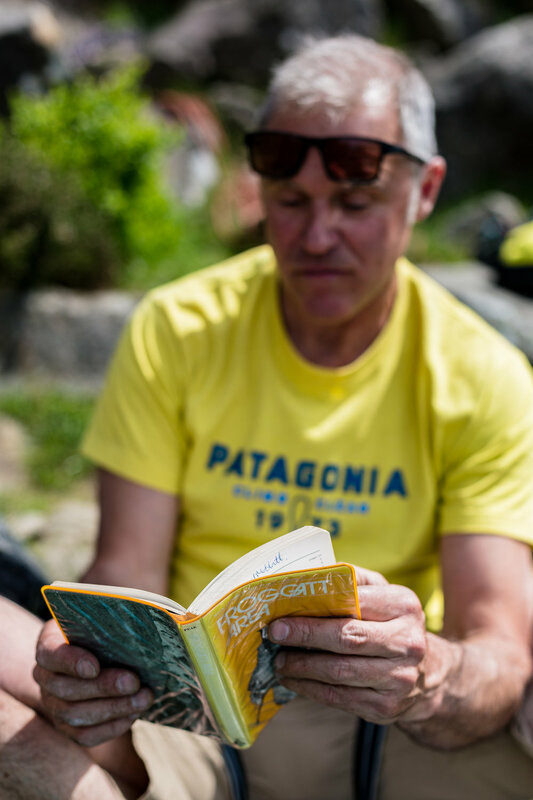 There is a lot more I could tell you about the history and philosophy of Patagonia, but for now you can find out more here. 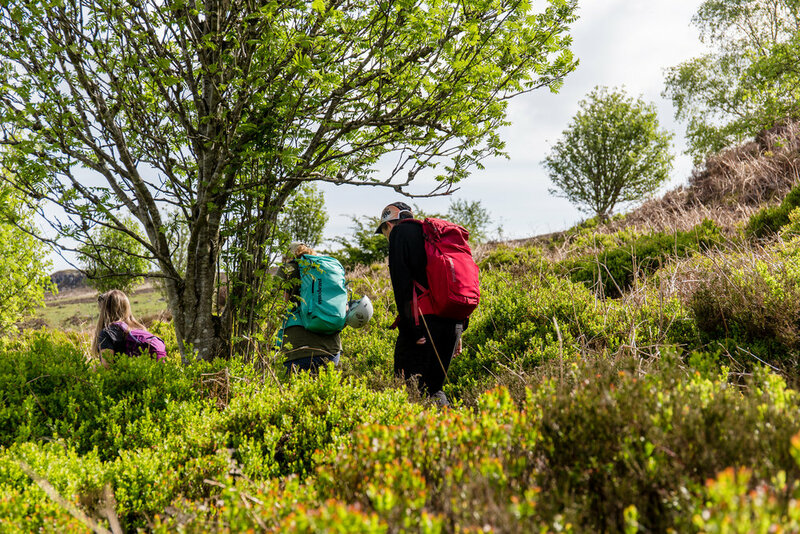 For today's outing, we were using Patagonia's climbing trousers, a hiking backpack and their innovative Micro Puff jacket - the best warm-to-weight jacket the brand has ever built. 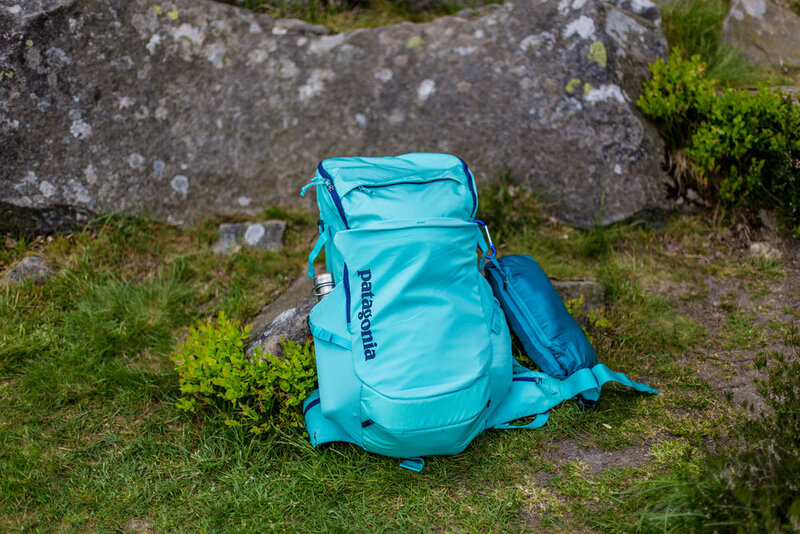 I wore the RPS Pants which I find endlessly comfortable, a Patagonia Fleur tank top which was ideal in the warm weather, and had my Micro Puff strapped to my 26L Nine Trails rucksack - it was much too warm for that on this particular day. After feeling confident on the first few climbs, I decided to give a route called Trapeze Direct a go. It was a VS grade, which would be the best I'd ever climbed. I can't say I was overly confident, but keen to try it knowing I'd get some direction from below. The climb was an easy ascent up to a bulging section, where a crack provided hand and foot holes - though it was difficult from the ground to figure out exactly how I would get onto these holds. It turns out it was also difficult from the wall... Once I'd reached this section, I balanced my feet on a thin edge and found a high-reach hand hold that felt solid. Now I had to figure out what to do next. I attempted placing my right foot in the crack, lifting my body with my arms and resting my left foot on the wall, but as all my weight was in my arms, there was no way I could move either of them to get higher up the wall. I ended up spending a long time on this section, trying the move over and over again, continuously falling off, and almost giving in. In the end, all it took was Robbie telling me to move my foot instead of my hand to get up to a large foothold that I could put my weight on, and in one swift movement I was over the bulge and back to easy climbing. It was amazing to complete that climb, even though I took my time. Climbing is as much about mental as physical strength, as much about technique as muscle. As I continue to climb, I can see all these elements coming together making climbs I never thought I'd be able to do seem more and more achievable. Learning from the best - Jerry Moffat! Thanks so much to Patagonia Europe and Canoe PR for inviting me along to the event, and to Robbie and Jerry for the awesome coaching. I'll be back out on the gritstone soon!